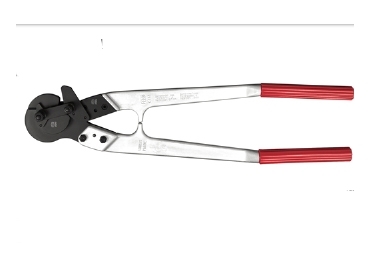 Felco Australia offers C112 Industrial Cable cutters. These are ergonomic tools with lightweight handles and a comfortable plastic coating. In addition, they operate with a helpful lever effect. C112 Industrial Cable cutters are also reliable. Their unbreakable hardened handles are made of forged aluminium and their blades and fastenings are made from high-quality hardened steel. C112 Industrial Cable cutters are very efficient. They have a force transmission system with cam device for easier cutting. They ensure a clean and precise cut without the possibility of crushing the cable. This is because of their triangular cutting system.